Pretty good, emotional adaptation of the musical featuring great visuals, solid acting, and some of the most exciting cinematic scenes I’ve seen in a movie in a long time. The film is definitely a heavy musical, though, as the far majority of it is sung rather than spoken, to its detriment at times. I also could have gone without the live singing; it’s a nice gimmick that certainly heightened many of the film’s individual performances, but it only really sounds good when done in group. Whenever it’s just one person singing, it’s awkward and hollow and fake; what 48fps is to video, this kind of singing is to audio in a way. See The Hobbit. It’s not as terrible as 48fps, but it’s definitely off-putting, which, combined with the strange closeups necessary to justify such close singing, makes for some rather bizarrely composed scenes that don’t always work. You do become accustomed to it after a while, but it’s definitely an acquired taste. The acting here is really the strongest part of the film, though. The music is good, sure, especially the catchier tunes, such as the sad “I Dreamed a Dream” song, and the exciting “Do You Hear the People Sing?”, and the hilarious, hilarious “Master of the House” that came at just the right moment and had me in stitches. Helena Bonham Carter and Sacha Baron Cohen are so funny here, stealing the show every time their two characters are on-screen. Baron Cohen is very limited even as a comic actor, but he’s good here, even if he is a bit hammy at times. But so, so funny. The real standout though was Russell Crowe. Who knew the man could sing? And he’s so good here, so convincing. Not a false moment in his entire performance. Everyone else is pretty good too. 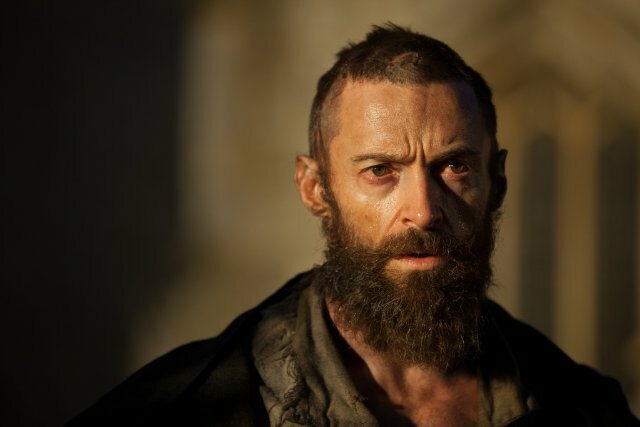 Hugh Jackman looks like complete hell, to his credit, as does Anne Hathaway who, yes, is okay and sings her song well and full of sadness, but doesn’t have all that much screen time. I particularly liked Samantha Barks who played Éponine, though; she’s the one who falls in love with the weird-looking red-head guy who’s in love with Amanda Seyfried’s character. I had a feeling right away that the girl was a theater actress and, lo and behold, she’s a Broadway veteran. She’s very good here, though a bit “much” at times, probably because she’s used to having to exaggerate her emotions for the stage and wasn’t given proper direction telling her otherwise, but she also has arguably the saddest, most emotional scenes in the film. And man can the girl sing. She’s the heart of the film, in a way. There are also smaller performances by lesser known actors that are really good, like the little kid with the blond hair and the cute little girl with the big bright blue eyes who plays young Cosette. The only actor I didn’t much care for was Amanda Seyfried, who has a nice voice but seemed stiff and out-of-place here. Everyone else, though, is top-notch. Very, very well cast film. Overall, a pretty damn good film, weird live action singing and all. The film definitely feels long at times, and some scenes are less interesting than others, but as a whole, the thing works a lot more often than it doesn’t, and some of the stuff that works really, really works. From the beginning shot to the end, the film is beautiful and creative visually, and some moments, especially the **SPOILERS** epic “Do You Hear the People Sing?” tune the young revolutionaries go into during in the middle of the parade, **END SPOILERS** are downright brilliant. Just pure cinema, through and through, and, as an added bonus, somewhat culturally relevant. The story is big and epic, yet not as epic as it could be as the film does tend to treat everything with the same level of importance, whether it be a romance or a revolution. But whatever: it’s a musical, not a sociopolitical piece.